There are various ways to lose weight including active lifestyle, strict diet plan and exercises. If you want to lose weight regular exercise and healthy diet regime – both are extremely important. But there are certain herbs or spices that can help you in your weight loss process by burning fat. One of these types of herb is ginger. Find out how does ginger help you to lose weight! 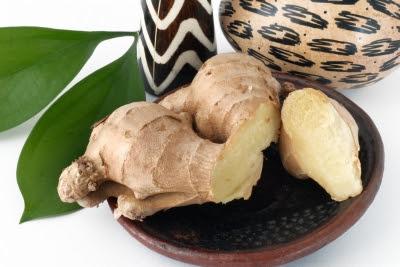 Ginger is known for its ability to enhance body's metabolism. It is very good for the digestive tract. It increases the pH of stomach acid and reduces stomach acidity. The positive impact of this herb on the digestive system makes it very good for preventing and treating any digestive disorders. Itasca very useful to detoxify the body and to promote blood circulation. By enhancing body's metabolism and improving digestive system, it helps you to burn more calories. Ginger increases the body temperature and stimulates the metabolism, and this causes body to use or burn off stored fat to increase the energy levels. This process is called thermogenic process. Eating certain foods like ginger can trigger this process, which is helpful in weight loss process. Ginger has the ability to reduce the cholesterol levels and it also stimulates cholesterol conversion to bile acids. By doing so it can increase bile excretion and there's less bloating and stomach upset. All these factors aid to weight loss. As said above that this herb or spice is helpful in good blood circulation. Good and healthy blood flow means more energy which can be very helpful in losing weight. Ginger is also a natural appetite suppressant, which is an important aspect of weight loss. The Scottish scientists who have made the ground-breaking discovery claim the spice could be part of the answer to curbing Scotland’s obesity epidemic. According to these experts, ginger compounds help break down fatty acids in food, which are then disposed of by the body rather than being stored as fat. This process helps not to gain weight and lose weight as well. Ginger should be included in any weight loss diet. It can speed up the fat burning process. Fresh ginger, dried ginger and ginger tea, any form of ginger diet is good for weight loss and overall health. You can also have ginger supplements but consult your doctor before taking any supplements. Nice One. I. Can the intake of ginger in excess have a negative effect on. Human health? Proto-col Slim-Fizz is a distinct appetite suppressant which is containing the groundbreaking fibre Glucomannan, which is a natural soluble fibre extracted from high quality pure Konjac. To be honest, I did not understand what ginger is. But the last couple of years with pleasure I use in food and tea. And not for a long time at all I tried ginger in sugar, an interesting taste.